Join Us and Be Restored! Restoration Church of Christ (RCoC) is a group of kind yet imperfect people striving to live our lives as committed followers of Jesus Christ. Like you, our lives are busy and demanding. Our roles and responsibilities tug us in different directions, and tasks and to-do lists stack one on top of the next. At Restoration, we believe that every day - every moment - is an opportunity to build a closer relationship with Jesus. We exist to glorify God as the one true Savior. Join us and be Restored! 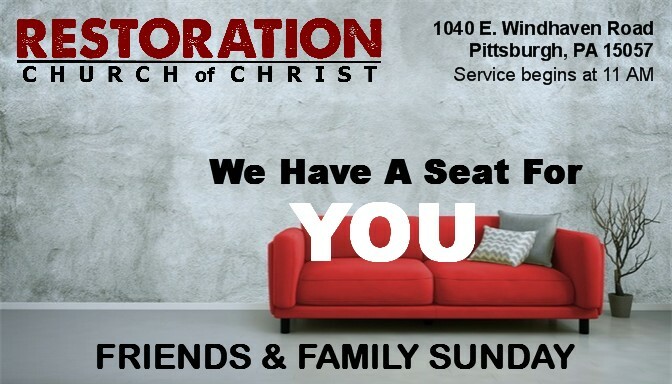 ...At RCoC, every Sunday is Friends & Family Sunday! Our congregation is the heart of the church. Warm and welcoming, our approach is humble, honest and heartfelt. We stand with open arms to welcome you just as you are, a brother or sister in Christ. As you explore the RCoC website, we hope you will feel encouraged by our resources and feel moved to join us this Sunday as we encounter the power of our Savior. Join us in celebration of this joyful, world-changing event! A CARRY-IN CASSEROLE BREAKFAST WILL FOLLOW THE SONRISE SERVICE. For your children, we have a fully-equipped nursery, modern youth center and graded programs where all ageS are included.